Ted Mahsun: Kiffe Kiffe Demaine by Faïza Guène. The book I'm currently looking forward to buying is a book that was wildly popular when it was first published in France in 2004, selling well over 70,000 copies. Originally published in French, Kiffe Kiffe Demaine by Faïza Guène is about a 15-year-old Muslim girl raised by her Algerian immigrant parents. Poor, they live in a ghetto on the outskirts of Paris. The novel touches upon themes such as cultural diversion and conservativeness as well as criticising the social systems in place. ...okay, so I'm not really doing a good job at making it sound exciting, but I will be getting this whenever it reaches here, translated to English. 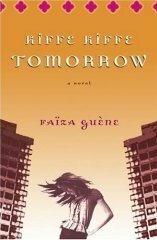 I can guess there will be a slight confusion though, as the US edition is entitled "Kiffe Kiffe Tomorrow", but the UK edition is entitled "Just Like Tomorrow". The book was released on 4 May 2006 in the UK by Chatto and Windus and will be released on 3 July 2006 in the US by Harvest Books.